Randy Reyes, artistic director at Mu Performing Arts. 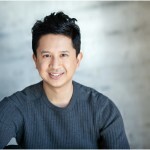 Accomplished actor/singer/director Randy Reyes has taken over, from founder Rick Shiomi, the artistic directorship of Mu Performing Arts. Randy is busy these days – the Mu handover occurred quite recently, plus he’s in the middle of directing Mu’s latest, Kung Fu Zombies Vs. Cannibals. He was kind enough to spend a half hour talking with HowWasTheShow.com on the phone. HowWasTheShow: First of all, congratulations. HWTS: It seems like the changeover has been smooth and organic. RR: It has. The board and staff at Mu made everything easy and Rick has been a great partner. We’ve had a great time shifting responsibilities. One thing has made this especially easy: a lot of people already knew me, so I didn’t have to introduce myself, tell my story. It’s all been wonderful. HWTS: Mu Performing Arts has been from its inception dedicated to celebrating and exploring the Asian-American experience. Do you anticipate that this will change in any way? RR: No. Mu’s mission has always been to examine and to build stories based on the Asian-American experience. This will continue. But: the experience changes. The Asian-American story evolves. And the works created by the writers we work with will also change. We’re going to keep open and responsive to their needs. HWTS: One thing I’ve often admired about Mu is the theater’s rock solid relationship with its audience. RR: Our community partners do terrific work. When we do a play by a Chinese-American author we work directly with that community, and they come. I’m especially happy about the support we’ve received from the Hmong community. This is a culture that doesn’t have a long tradition of play-going. But we could do better. We don’t have the cross-over audience that I would like. We’re not as able to say, as much as I’d like to, “This is about being Asian. These issues affect you even though you may not be Hmong, Filipino, etc.” The fact that we don’t yet have our own performing space doesn’t help. HWTS: You are a terrifically accomplished actor and director. Do you intend to develop this talent? RR: I’ll do as much as time will allow, but during my first year at Mu I’m not going to do as much. But I do want to keep my relationship with other theaters going. In particular I want to direct elsewhere. There’s precedent for it and I think Mu will benefit from expanding my experience, from new perspectives I’ll gain from working at other theaters. HWTS: Tell me about Kung Fu Zombies Vs. Cannibals. RR: The title says it all. The hero’s family has died and she battles zombies and cannibals in the post-apocalyptic world of the play. But there’s also serious morality in play; the play is based on the five Buddhist tenets. The author, Saymoukda Duangphouxay Vongsay, is a Laotian-American spoken word artist. We’re collaborating with the Jerome Foundation to help establish her as a theater aristo. The show has dancers, martial arts fighters, an onstage DJ. I’m especially pleased to be working once again with fight choreographer Allen Malicsi. HWTS: I don’t recognize any of the actors. RR: Only four of them have worked at Mu before, another way we’re expanding. HWTS: The play sounds like great fun. Kung Fu Zombies Vs. Cannibals opens Oct 12 at the Southern Theater.